Aroma Magic Bridal Glow Facial Kit - Gives Natural Glow, Imparts Dazzling Radiance, Revitalizes Skin, Suitable For All Skin Types. 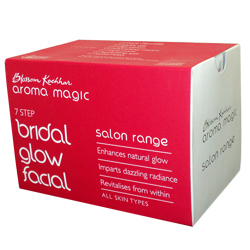 Bridal Glow Facial Kit From Aroma Magic Online Shop. The 7 step facial enhances natural glow and imparts dazzling radiance to the brides. The unique ingredients counteract the damage caused by pollution and stress and leave your /your client?s skin revitalised and polished. Cleanses face from deep and removes all dirt, grim and excess oil from deep skin layers. My face was squeeze clean after this cleanser. Exfoliation using gel, I love it. Gentle exfoliation and it loosen up the dead skin cells and shed easier. You can see in the picture, the Revitalizing skin serum comes in cute little glass tube like packaging. The serum deep penetrates into the skin and revitalizes the skin from beneath. Nourishing cream is more like a massage cream. About 10 to 8 minutes massage from this cream give even skin tone and well-nourished skin. It gives cooling sensation and reduces the appearance of the pores. Face pack adds immense glow to skin. Helps to hydrate the skin well and gives translucent skin from inside. Very light sunscreen helps to protect the glowing skin from sun rays. Within few minutes the sunscreen penetrates into skin and gives a neat finish. This facial kit contains 5 units of each, to do 5 facials.